Hale pet doors are the finest quality you can buy. We use only the best materials and pride ourselves on the quality of our workmanship. We have had many customers tell us that they have had their pet door for more than 15-20 years. However, over time with continuous use even the best quality pet doors need a little upkeep. The flaps can get cloudy from doggie and kitty noseprints accumulating. The carpet can get dirty from little pawprints. The magnets can get loose or pushed too far into the frame to prevent a good seal with the flap. But with just a little bit of care, you can keep your Hale Pet Door™ looking like new for years to come. Following are a few simple suggestions for maintaining your pet door. Use a mild detergent (such as dish soap), lukewarm water, and a soft cloth to clean the pet door frame, the PVC vinyl flaps, and the security cover. Simple Green is also excellent for cleaning the flaps. Never use an ammonia based cleaner on your pet door. 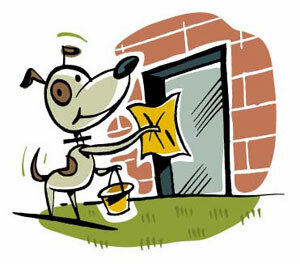 A vinyl protectant coating can be applied to prolong the life of your pet door’s flap(s). If desired, you may add this protection by applying a vinyl protector (such as Armor-all) or Turtle Wax to the flaps. If you purchased a Hale Pet Door™ wall model with a tunnel, the carpet can be easily cleaned with any vacuum with a hose. If it should become stained, any carpet spot cleaner should work to remove the stain. All glass used in our “In Glass”, “Panel” and “Window” models is tempered safety glass and can be cleaned with any standard glass cleaning product. The magnets and weather stripping on your Hale Pet Door™ are all fully adjustable. If necessary, use a flat head screwdriver to pry the magnets out. Or you can turn the screwdriver around and use the handle to tap them in gently. They can then be replaced or repositioned as needed. Of course, if you do need to replace any parts to restore your Hale Pet Door to its former glory, we offer replacement flaps, security covers, magnets, weatherstripping, and more. Please visit our website at http://www.halepetdoor.com/products.html to order any replacement parts you may need.